A pop ballad composed for the Netherlands' new king has been withdrawn as the official anthem following ridicule and outcry by thousands of Dutch citizens. Released on Friday, John Ewbank's Koningslied (King's Song) drew 40,000 signatures to an online petition calling for the project to be abandoned. 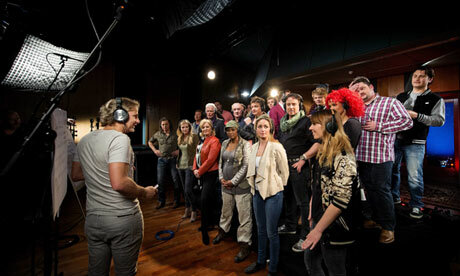 Koningslied was recorded in preparation for the abdication of the Netherlands' Queen Beatrix, on 30 April. On that day, her son, Crown-Prince Willem-Alexander, and his wife, Princess Maxima, will become king and queen. An inauguration committee supervised the process of finding a song to mark the occasion, soliciting lyrics from the public and selecting Ewbank, who was born in Eastleigh, Hampshire, to compose and produce the music. Fifty-one musicians, many of them domestic stars, participated in the song's video, crooning, rapping, squeezing accordions, and throwing the three-fingered "W" salute. "W for Willem/ three fingers in the air," beseech the lyrics. "I will wake as you sleep/ I protect you from the storm … Let me know what you dream." Although the sentimental song shot up the Dutch singles chart, thousands signed Sylvia Witteman's blunt petition. "In protest at this imbecilic King's Song, I hereby abdicate as a Dutch subject," Witteman wrote. On Saturday, Ewbank officially withdrew the song from use at the investiture. "After having to block yet another insult on my Twitter account, I am now totally done," he tweeted, proposing that the inauguration committee use the Je bent een Koning, recorded by amateurs in Utrecht. In a statement to the Netherlands' national news agency, officials said they "regret [Ewbank's] decision" but still hope the public will "serenade the king" at next week's swearing-in. Over the past two decades, Ewbank has scored dozens of Dutch hits with artists such as Gordon Heuckeroth, Marco Borsato, and Nikki. As member of the band Shift, he led a failed bid to represent the Netherlands at the Eurovision song contest in 1990.